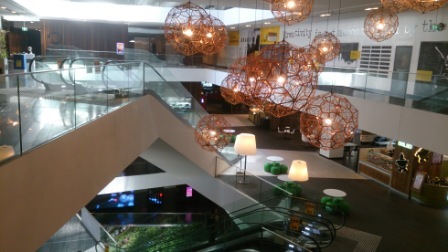 The Feng Shui of a home is very different that the approach of commercial buildings. In a home, we look for balance and harmony, for Yin energy to relax in specific areas. 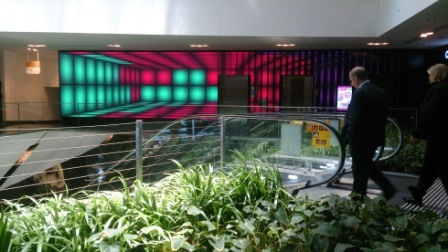 In commercial premises we encourage much more Yang energies in order to keep things moving and business thriving. The angular finish of this very tall building hosting a shopping centre on his first few floors is tastefully accompanied with hanging gardens. 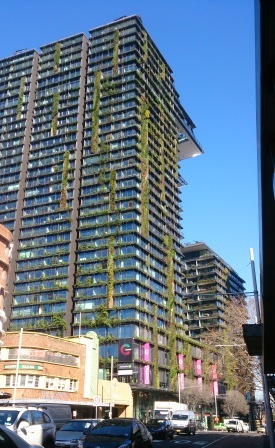 Real green plants in an urban busy environment brings the idea of health and life. Escalators move Chi upwards and downwards. In this photo, we see how important mirrors are doubling this effect. 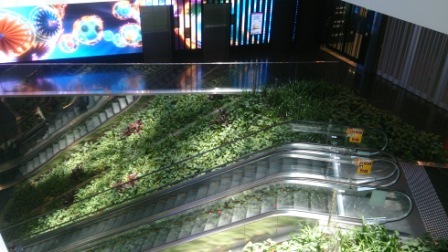 In addition to the doubling effect, the healthy green plants on each side are also doubled and enhance a great feeling. 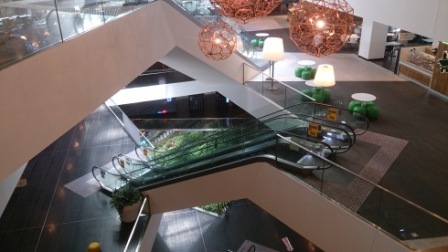 The design of the various floors of this building shows a variety of shapes bringing active Chi flow. 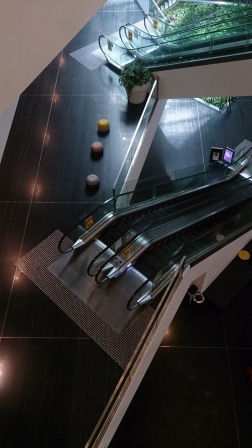 Each floor has a different purpose, for example one of its floors is a healthy and quality food court, another one is a creative and artistic level offering opportunities to artists and art enthusiasts. 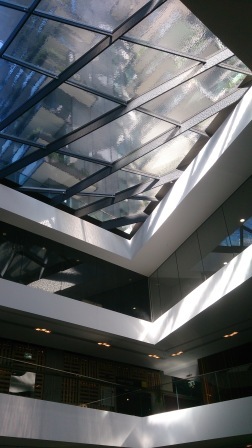 The whole project looks great to me; having said that, I have only one doubt… The roof above the first floors is made of glass covered with shallow moving water. I would question this feature from a Feng Shui perspective as I would have designed a sky above our heads instead of a permanent moving water. Please beware of what is Feng Shui labelled! Watch out – NOT everything labelled ‘Feng Shui’ is good Feng Shui! The first example that I recall is till in my mind today. It happened when I attended my initial first Feng Shui course… the teacher at the time told one of the student to hang a faceted Feng Shui crystal in her entrance because the stair case was directly opposite to the main entry door and the Chi was rushing upstairs. One week later, that student came back to the course very worried: three major things broke: the windscreen of her car got chipped, she broke one of her front teeth and twisted her ankle! The problem is that she bought a POINTY faceted crystal labelled ‘Feng Shui’ in the shop. The wrong part of it is that a POINTY crystal is NEVER good Feng Shui as it sharpens the energies in the place! This can be VERY dangerous. NEVER hang a pointy crystal ! 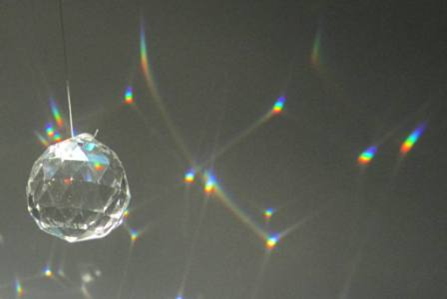 Within the week of hanging this faceted pointy crystal between her entry and her staircase, she encouraged sharp energies and 3 things broke down. After the second Feng Shui lesson, she threw it away immediately and replaced it with a ROUND faceted crystal and everything settled down for the better. 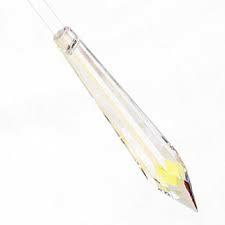 For the past 20+ years I have constantly encountered people who had life problems due to pointy crystals so please, avoid displaying them around you! Pointy crystals should NEVER been labelled Feng Shui, this is wrong! Only display round, oval or octagon faceted crystals, thank you! ONLY use round, oval or octagon faceted crystals to enhance Chi around you! Think common sense Feng Shui, is it vital!